Last week in an interview on Piers Morgan Tonight, Herman Cain, Republican presidential candidate/possible long-gestating Punk'd prank gone awry, made some confusing statements about his stance on abortion, saying it shouldn't be legal under any circumstances and is also a woman's choice when she's been raped or her life is at risk. Some conservatives were angered by his suggestion that sometimes ladies should get to make their own health decisions, so last night at a campaign event in Iowa, Cain reassured everyone that he's extremely pro-life. In fact, he won't let the government pay for abortions. And he wants to refund the Planned Parenthood! Bureaucrats shouldn't even think about making choices from the bench! And a bunch of other things his staff told him to say! "In terms of preventing abortion on demand, I would not sign any legislation where government funded abortion ... I would not sign any legislation that, in a way, allowed the government to get involved in it. I would strengthen all of our current laws that prevent abortion. I believe that abortion should be illegal across this country. And I would work to de-fund Planned Parenthood. And I would make sure that I appoint judges that will enforce the Constitution — no activist judges. And I would also make sure that we didn't allow any bureaucrats to get in the way in order to protect the life of the unborn." 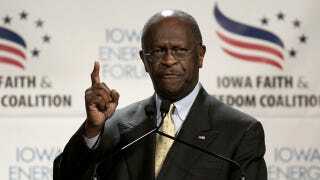 Yet, some Republicans were disappointed that Cain didn't offer a more detailed explanation of his views on abortion. While other Republicans mingled with people in the crowd, according to the New York Times, Cain stayed on his campaign bus until it was time for him to speak, and left shortly after his speech, leaving little time to be angrily confronted by anti-choice nutjobs. "Being pro-life is not a matter of campaign convenience; it is a core conviction ... It is a liberal canard to say I am personally pro-life, but government should stay out of that decision ... If that is your view, you are not pro-life, you are pro-having your cake and eating it too." That's a pretty surprising statement coming from Perry. It's not like him to pass up the opportunity to say, "pro-having your pizza and eating it too."